Two patterns in one, a ruffled cape or a plain cape, both are fun and easy to make. You will need a 5/8 inch or 1/2 inch gauge loom with 27 pegs for the plain version and 35 pegs for the ruffled version. The pattern works well with a variety of yarns, from worsted weight cottons to bulky wools, which makes it a year-round cape. It looks especially nice in a yarn with a lot of “fluff” or halo, such as Knit Picks Reverie. 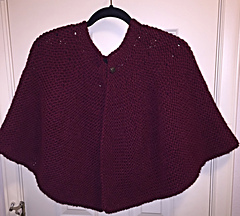 September 2014: This is the revised version of the Peony Cape pattern. It includes two separate patterns, one for the cape with a plain edge, and one for the cape with a knitted ruffled edge.